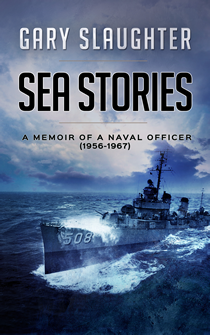 AT THE HEIGHT OF THE CUBAN MISSLE CRISIS, ENSIGN SLAUGHTER FOUND HIMSELF STARING EYE TO EYE WITH THE CAPTAIN OF A SOVIET SUBMARINE. ARMED WITH A NUCLEAR TORPEDO. On October 27, 1962, the USS Cony surfaced B-59, a Soviet submarine. Gary Slaughter, a 23 year-old US Navy Ensign, studied the sullen face of Captain Vitali Savitsky at a distance of only 200 feet. Slaughter was the only officer on Cony trained to communicate with the Russian Captain. His objective was to dissuade Savitsky from launching its torpedo which - as Slaughter learned 40 years later - was tipped with a 15 kiloton nuclear device that would have precipitated an all-out nuclear exchange that most certainly would have destroyed the world. Finding likability and humor in the people and situations he encountered during his Navy career, Slaughter brings his experiences to life with the same writing skills found in his series of five award-winning Cottonwood novels set on the World War II home front.